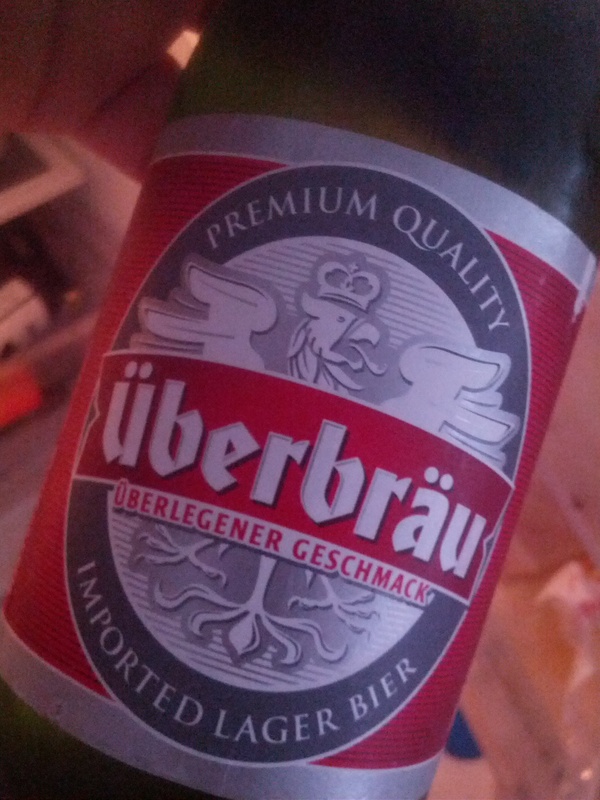 The beer: Uberbrau (There should be umlauts over the first U and the A but I don’t know how to do those). It’s a lager. Where did it come from? : I got it from a First Choice Liquor outlet, but it originally comes from Germany. Via Australian Beer Connoisseurs, which equals Liquorland, which equals Coles. What’s it like? : To be honest, better than most other mainstream lagers. There’s a malt aroma with a smidge of wet cardboard and the flavour is of sweet malt (almost honey-like) with a bit of bitterness at the tail-end. Okay, now you can tell the story you think is funny/interesting? : I picked this up figuring I could have some fun tearing into the beer on this blog. Partially because it has a name that sounds like it should be in some tacky low-rent movie comedy about a brewery (‘‘Uberbrau. For when you have a big thirst’’) where they put some woman in a German beer wench outfit for no good reason. And yet it surprised me. Not in a ‘‘jeez, I’m going to buy so many cases of this that I’ll be able to use them as bricks in a cardboard house’’ way. More in a ‘‘smart-arse blogger let his preconceptions get the better of him’’ way. Just bought a case of this crap for $30 !!!! Can’t tell the difference between this crap and a glass of water. Actually the water might have a little more taste. Putrid vile crap this is !! I love this beer. Much better than XXXX, VB and oher expensive aus crap. I absolutely agree. It’s all I buy now as it’s a tasty easy drinking lager that does not give me a headache or give me a hangover after a big session. I would still buy this beer if it was $50 a carton. I’m so over all of these try hard heavy craft beers that give you a throbbing headache after a few beers. I’ve gone back to drinking lagers! I’ve been drinking craft beer for ages. Hardly had a hangover – so I’m not sure it’s the beer giving you a hangover. It can be spelt Ueberbraeu to get over the umlaut problem. tried it. not too bad. but when you equate the $30 case in 330mL bottles to a case of normal 375mL bottles it’s not that cheap. The 375mL equivalent carton would be $34. That’s still cheap. The 375 ml equivalent is also more likely to be more than the 4% of Uberbrau so as a cheap “alcohol delivery method” its lost around 20% of its value due to its low alc content. For the sake of interest I tried to find information on that beer in German web. No single reference appeared in responce. It looks very suspicious. I can imagine that it is brewed not by what is called in Cole’s advertisement ‘one of German’s oldest and most awarded breweries, but somewhere in China. What makes it even more suspicious is that there is nothing about that beer on beeradvocate.com. It’s obviously a private label beer. Hey bro I got this for my mum she likes it but we need to know the sugar content as she has diabities and I cant find the info anywhere? Can u help at all? Sorry, I’ve got no idea whether they use sugar or not in this beer. Though most beers don’t these days. Does anyone know the sugar content in this?? This beer is a disappointment. Pretty much the lowest quality European beer I’ve ever tasted in my life. This and Oettinger. Not many people in Europe would drink this other than alcoholics if it is very cheap. I’m European, and I find all mainstream Aussie beer crap, except Coopers. For the same money you’re better off buying Hollandia or Arc Valley from Holland. Or the Cleanskin from Liquorland (brewed in South Korea). Even Hammer & Thongs (brewed in South Korea) tastes better than Überbräu IMO. It’s a shame we have such a hard time getting a proper beer, brewed with SPRING WATER ( NOT FLUORIDATED tap water!!!) for a fair price in Australia. oettinger is an amazing beer, so popular in europe, I think your just a beer snob buddy. Loved the review. Bought two 6-packs for $10 at Liquorland, so it seems it’s ‘holding strong’ against inflation, since this was written. I’m not too fussed about beer, so is this the cheapest ‘alcohol delivery substance’ in lager form in Australia right now? It probably is the cheapest beer you can get. Only one I can think of that comes close would be Cleanskin Beer, which is $3 more expensive per case than Uberbrau. I reckon Uberbau is one of the best beers. It is brewed to very exact German purity laws.